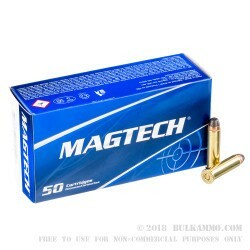 These semi-jacketed soft point rounds from Magtech are a great choice for hunting and range use in .357 Magnum revolvers and carbines. The heavy 158 grain bullet achieves a muzzle velocity of 1235 feet per second, producing an impressive 535 foot pounds of muzzle energy. 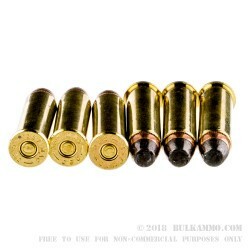 Each round in this box of 50 uses Boxer-primed reloadable brass casings. Magtech ammunition is produced in Ribeirao Pires, Brazil, by the Companhia Brasileira de Cartuchos (CBC), one of the country’s oldest ammo manufacturers. Founded in the 1920s, CBC operates its 500-acre vertically integrated production plant with state of the art technology including automated assembly lines and quality control systems. The company supplies the Brazilian military with ammunition in addition to exporting ammo under the Magtech brand. Magtech USA operates from a dedicated office and distribution center in Minnesota. Only brand I use for my revolvers. 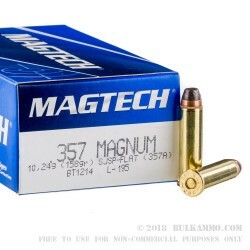 A: Yes, 158gr .357 Magnum ammo is a good choice for deer hunting with a Marlin lever action rifle. 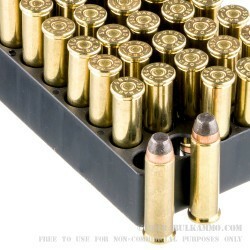 As with any caliber ammo, proper shot placement is key to a successful hunt. Q: Do you sell dummy rounds in any caliber for practice? A: No, we do not sell snap caps or dummy ammo, sorry.